For those who love to get the most out of your time cruising, we now have a selection of Croatia small ship cruises that also visit other countries nearby. These small ship cruises sell out quick due to the small number of cabins available, so do please get your enquiry in as soon as you can. Thank you. Mini-cruises (under 7nts) are extremely limited and book out fast, as do our One-way 7 night cruises. So get in quick for those! Cruise/Tour combos are also extremely popular and somewhat limited (especially those with a one-way cruise). Cabin charter on a gulet or sailing yacht is also a popular choice for those who prefer a smaller, more intimate group. Cabin charters are also very limited, so do please get your enquiry in as soon as you can. If you're looking for something active, check out our Cycling and E-bike cruises. To search by month of departure with availability, head to our Available Cruises by Month page and click on the month you want to go. There's something for everyone! 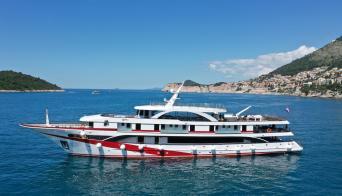 Combine a land tour and cruise for the best of all worlds and really discover Croatia. If you've seen something on another website that you look and can't see it here, please send us the link with your contact details in an email to [email protected] or call us on Ph/WhatsApp +61 2 9212 1507 and we'll source the best price for you.